Everybody was very friendly and helpfull. They could not really do anything for me, they were truthfull. I respect that. We always receive quick scheduling and friendly, knowledgeable, thorough service! I was treated like the the most important person in the world to them. There was time to discuss the procedure and recovery. I left confident in them and my future. Great team of doctors! Dr Wolf was very clear of what my options were and described how the procedure would go. The staff and Dr. seemed to really care. The Drs explanation of what he would do was Understandable. I appreciated the written word also. Dr Crane was able to quickly diagnose the source of my wrist pain and treat the problem. I’m back to what I was before the injury and couldn’t be happier! Dr David Crane has preformed 3 procedures on me starting in 2015. The results have been beyond amazing! In 2009 I injured the lumbar region of my spine and my spinal cord was tethered in an accident. In 2012 the pain was becoming extremely severe and I began going numb from the waist down. My primary care Doc ordered an MRI and had me send it to Bluetail Medical Group, Dr Crane in particular, to see if I might be a candidate for regenerative medicine. Unfortunately, Dr Crane saw that I wasn’t a candidate and referred me to a Neurosurgeon friend of his In Dallas. The neurosurgeon actually called me and talked with me for over 30 minutes. He explained the problem to me and exactly why surgery was absolutely necessary, then referred me to a local neurosurgeon in my hometown of Savannah, Ga. I had surgery in 2014 and had good success as far as the pain in my back but was left with peripheral neuropathy in my feet and legs. I did gain limited motion in my lower back that I had lost due to the injury but not total mobility. I was dragging my left leg somewhat. In 2015 I began sensing numbness in my left hand and severe pain in my neck with very limited ability to turn my head to the left. After an MRI the neurosurgeon advised me he needed to remove 5 discs and replace them with plastic ones and screws. I then mailed my MRI to Dr Crane and this time I was a candidate for regenerative procedures. My experience was great and within 6 months the numbness began to disappear, the ability to turn my head began to improve and within 12 months I had full range of motion and no numbness. On the day Dr Crane treated my neck he also treated a left knee injury where I had torn the meniscus. In less than a year I was pain free in my knee and back to walking normal on it. January 2018 Dr Crane treated my lumbar spine and one year later, January 2019, I can bend over touch the floor, do sit ups and crunches totally pain free, with pretty much full mobility. I’m back in the gym! I admit that I still deal with peripheral neuropathy in my feet and legs due to damage done to my spinal cord, although it is not as painful as it used to be. Dr Crane was up front with me about that and didn’t know how much relief I would get from it. I’m happy to have even some relief. If you are in the decision making process whether Regenerative Medicine might be right for you, PLEASE, read over all the information on BTMG’s website. It is extremely informative on the different treatments and procedures that can be done for different problems instead of being cut on or lasered. The healing time passes so quickly and within 4 days of the procedure your back up and on your feet. I talk to people all the time about my experiences with bone marrow stem cell procedures and what great success I’ve had. I’m very excited about the future of regenerative medicine. There are options other than traditional western medicine. It’s important to educate yourself so you can decide what is the best avenue to take. I want to close my comments with these thoughts. 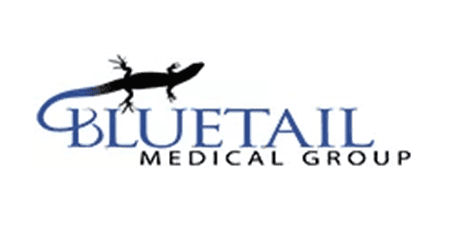 Being a patient of Dr Crane and the team at Bluetail Medical Group has been blessing to me. You won’t find a more qualified group of professionals to take care of you. They make it so easy for you from your initial call to send in your imaging to the day of your procedure and follow up. They are kind, caring, informative, patient and fun. The office and surgery center in Chesterfield, Mo is state of the art and unbelievably clean. I’m so glad I listened to my primary care Dr and gave regenerative medicine a try. Very professional informative and prompt service! Each staff member was very professional, punctual and made us feel very welcomed. Sam the nurse is so kind and comforting. Dr. Crane takes the time to talk things through with me and to listen. Kind and courteous. Very satisfied. Today was my lucky day. I saw my primary care doctor for a painful right knee/leg. Dr. Podesta just happened to be in his office & agreed to see me. Dr. Podesta is recognized as an outstanding sports medicine physician. He was thorough in his exam & I trust his decision regarding my leg having a torn muscle. He was very patient with me & had a comforting manner. Thank you, Dr. Podesta!